Finance ministers from across Canada have agreed to slow down the pace to make possible changes to the Canada Pension Plan. 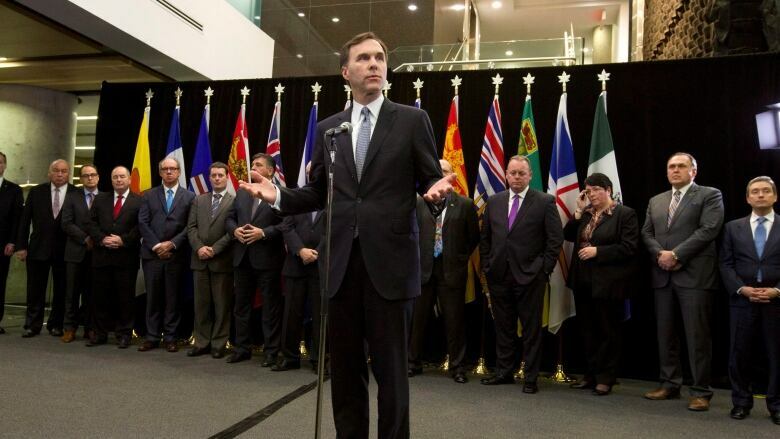 At a closing news conference with his provincial and territorial counterparts in Ottawa today, federal Finance Minister Bill Morneau conceded that the status quo is an option due to the sluggish economy. Finance ministers from across Canada have agreed to hit the brakes on potential changes to enhance the Canada Pension Plan. At a closing news conference with his provincial and territorial counterparts in Ottawa today, federal Finance Minister Bill Morneau said discussions would continue — and conceded the status quo is an option due to the sluggish economy. While ministers will work to achieve "milestones" in the coming year, there will be more consultation and study before any changes are proposed for the CPP, he said. Will Morneau rally enough support to boost CPP? "We have a range of things under consideration — from doing nothing because of the economy to more significant changes, and we think that's the appropriate first step, to begin consultations on a range of options with Canadians," he said. The ministers will meet in June 2016 to review "substantive options" and again in December to chart a course forward. The Liberal campaign platform promised to "work with the provinces and territories, workers, employers, and retiree organizations to enhance the CPP." A spokesman for the minister said the government is intent on delivering on that promise. "Minister Morneau is absolutely committed to ‎moving forward on enhancing the CPP and to providing retirement security for all Canadians. (Monday's) meeting was a very positive step in that direction," said Daniel Lauzon. Ontario Finance Minister Charles Sousa said his province will proceed with its own pension plan, and invite other provinces to participate. At the same time, Ontario will run on "both tracks" to engage in talks aimed at enhancing the CPP, which he called a well-run, well-financed program. "Part of the discussion that's going to happen over the next six months is to review alternate, more innovative plans in conjunction with what CPP may offer," he told CBC News Network's Power & Politics. Finance ministers got a briefing from Bank of Canada Governor Stephen Poloz during the day-long meeting, that including talks on equalization, health transfers and infrastructure spending. "What we would like to see is for those infrastructure dollars to come out as soon as they possibly can, and the minister addressed that today," said Saskatchewan Finance Minister Kevin Doherty. Morneau could not provide precise details on how the money will flow at this "early stage, but said the federal government is committed to infrastructure investments to kick-start economic growth. "Doing that in a responsible way is important, but doing it in a rapid way is important because we recognize that to have the economic impacts that we want, we need to move forward quickly but responsibly," he said. The Liberal government has promised $125 billion in infrastructure spending. Heading in to the talks earlier today, several provincial finance ministers said the federal government should be in no rush to expand the CPP and should instead make infrastructure and health spending the top economic priorities. British Columbia Finance Minister Mike de Jong warned that adding a financial burden to employers and employees while the economy remains fragile could have a "negative economic impact." "We have to be cautious, but at the same time I don't think we should shy away from the conversation," he said. Doherty said the federal government and provincial partners should hold off to see how other "products" such as the tax-free savings account (TFSA) and pooled pension funds work before embarking on a "broad-based solution," like expanding the CPP. "We're not saying never, we're just saying right now is not the right time and we're not prepared to move on that at this time," he said. "Infrastructure spending will critically help the depressed economy that we have now. It will put Albertans back to work, it will leverage up the funds that municipalities wish to spend, that we wish to spend across the province," he said. As for expanding the CPP, Ceci thinks the best route is to send officials away to study options and come back with recommendations to build consensus. Provincial and territorial finance ministers arrived Sunday night and attended a dinner hosted by Morneau. Meetings will continue through the day Monday, with a closing news conference scheduled for 3:30 p.m. The federal Liberals promised to expand the CPP during the election campaign, but needs to have at least seven provinces on board representing two-thirds of the Canadian population to move on the reforms. Quebec Finance Minister Carlos Leitao agreed there must be more study and analysis to determine next steps, but he believes a targeted system geared to income levels is likely the way to go. "We don't think it's necessary to have broadly based increases on CPP, but some targeted increases, there could be a strong case to be made," he said. Ontario Finance Minister Charles Sousa said the theme of the meeting is "collaboration" and laying the groundwork for further discussions around "principles." "It's collaborating with the provinces around retirement security, but it's also about trying to formulate how we can best stimulate economic growth," he said. Newfoundland and Labrador Finance Minister Cathy Bennett, who has only been on the job one week, and New Brunswick's Roger Melanson said infrastructure and health transfers are top priorities. While not opposed to CPP changes, they both called for more dialogue and more time on the issue during this period of economic volatility. CARP, an advocacy association for older and retired Canadians, said Canadians support a CPP increase "by wide margins" and urged the provincial and territorial ministers not to continue on the path of "political foot dragging." "All this posturing is really getting old. The federal and Ontario elections were fought and won on this as a major part of the platform," said CARP executive vice-president Susan Eng in a news release. "It is well past time to act on ensuring that all Canadians can save adequately for their own retirement."